Happy Friday! As promised, here are the recipes for our s+s party. Enjoy! In a tall glass, muddle the raspberries and mint leaves. Fill the glass with ice and squeeze in the juice from half a lemon. 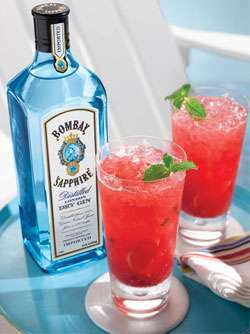 Add simple syrup and BOMBAY SAPPHIRE Gin and mix thoroughly. Top with club soda or lemon-lime soda. Garnish with a sprig of mint. 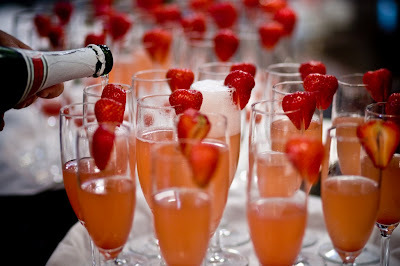 In champagne flutes pour in strawberry puree. Pour champagne over it to blend. It should have a pink blush to it. In a large bowl, toss 1/2 pint strawberries, rinsed, hulled, and quartered, with 1 tablespoon balsamic vinegar; let sit 5 to 10 minutes. In a small bowl, whisk together another tablespoon balsamic vinegar with 2 tablespoons olive oil and 1/4 teaspoon each salt and pepper. 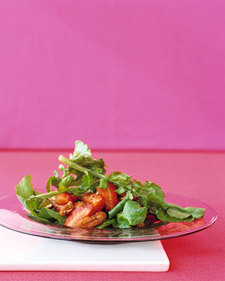 To the strawberries, add vinaigrette, 1/2 cup toasted pecan halves, and 2 bunches arugula, trimmed and thoroughly washed and dried. Toss to combine, and serve. Preheat the grill to high. Remove the steaks from the refrigerator and let stand at room temperature for 20 minutes before grilling. Meanwhile, combine the cumin, salt, and pepper in a small bowl. Liberally season both sides of each filet with the spice mixture. Grill the filets for about 3 to 4 minutes on each side for medium doneness. Meanwhile, preheat the broiler. 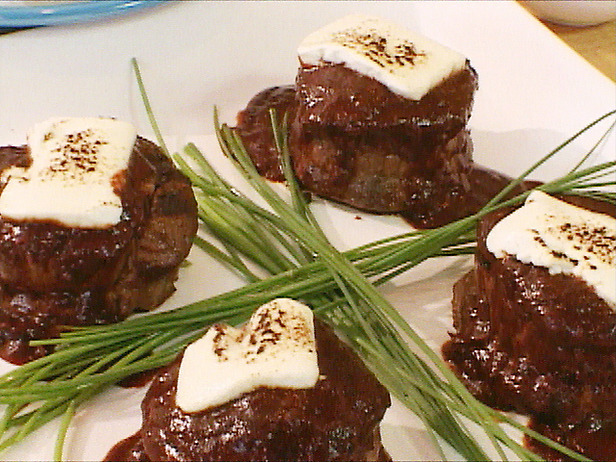 Remove the steaks from the grill onto a baking sheet, and top each with a slice of the cheese. Place under the broiler until cheese is golden brown and soft. Alternatively, use a blow torch or kitchen torch to brown the cheese. Ladle the sauce onto each plate, place the steak in the center, and garnish with chopped cilantro.